Thirsty? Don’t count on quenching your thirst with water at the Grand Canyon, unless you’ve brought your own bottle. The National Park Service recently announced that it will be banning the sale of plastic water bottles at the national landmark by the end of next month. Visitors can bring their own disposable water bottles into the park, and 13 water filling stations will be available within the canyon to top off any kind of container. According to the park service, plastic water bottles make up 30 percent of the materials recycled in the Grand Canyon, and 20 percent of trash. So, It’s hard to argue that reducing the number of plastic bottles in a national park could be anything but a good thing for the environment and for keeping the Grand Canyon pristine. But, the new rule only applies to plastic water bottles, and sodas and juice will still be sold in plastic bottles at the park. This is why you’re fat, America. Gone for a refreshing hike and forgot to bring a canteen? Refresh yourself with a nice sugary soda or juice that’s more calories than you just burned off! We think this policy doesn’t go far enough—if you’re going to ban plastic water bottles, all plastic bottles should be banned from sale in the park. What do you think? Should the Grand Canyon should sell whatever beverages they want? Or do you think eliminating plastic bottles from this environmental treasure is a good thing, and will encourage people to use reusable bottles? 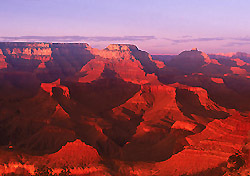 Did we whet your thirst for a Grand Canyon adventures? Check flight prices to Flagstaff here.